Compostable Cold Cups Direct from Asia's #1 Supplier of Compostable Products and Resins - Replace Plastic with 100% BPI-CERTIFIED Compostable Drink Cups, 16 oz, 1000 Count. Minima compostable cold cups are available in 12 oz, 16 oz and 20 oz sizes + two different styles of tight-fitting lids (domed or flat). Mimina's cold cups feature original artwork depicting playful "leaves" that dance in the wind. Check out all Minima's foodservice products. * CERTIFIED COMPOSTABLE. 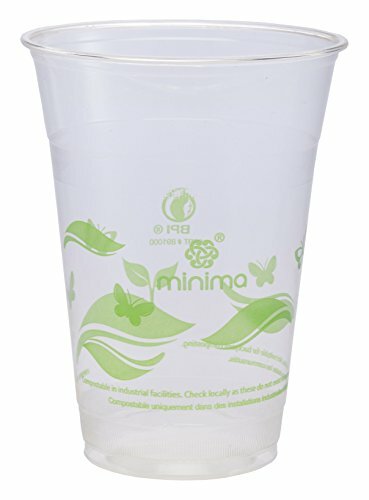 Minima Compostable Cold Cups are certified by independent authorities to completely and safely compostable in commercial composting facilities. * ACHIEVE ZERO WASTE GOALS. Minima compostable cold cups are 100% compostable. You can avoid the landfill and compost them at any of more than 500 municipal and commercial composting facilities in North America. Regular polystyrene or PET cold cups are difficult to recycle and are not compostable. * SUSTAINABLE & ECO-FRIENDLY. Minima cold cups are made from natural polymer (poly lactic acid or PLA) derived from sustainable sources. PLA is 100% compostable in commercial compost facilities. * FITS STANDARD DISPENSERS. Minima compostable cold cups have the same dimensions as other cold cups. So they'll fit right into your existing cup dispensers. You'll make a positive step to help the planet without disrupting your existing operation. * BUY DIRECT AND SAVE. Minima is Asia's #1 brand of compostable products and resins. Unlike other suppliers, you're buying compostable cold drink cups directly from the manufacturer. So you can always get the best quality and value. If you have any questions about this product by Minima, contact us by completing and submitting the form below. If you are looking for a specif part number, please include it with your message.